As the summer approaches you're all probably looking forward to barbecues on the patio, sipping margaritas in your bathing suits, gnawing on overcooked chicken legs, and watching the sunset delicately set fire to the evening sky. Then you wake up and remember that you live in Britain, where sunny outdoor meals are things that other people experience. With that in mind, you really need a grill that you can quickly bring indoors once (not if) the rain starts; one that won't fill your house with smoke or burn it down. You need the Ambiano Electric Grill from Aldi. Good old Aldi. 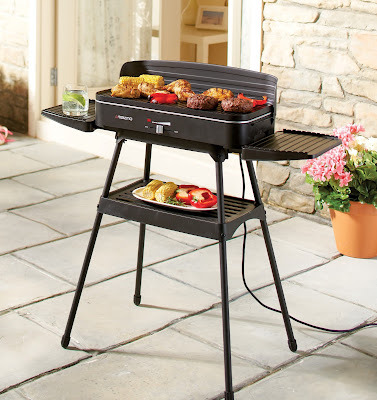 Their latest Specialbuy range has been designed to outfit one and all in preparation for the sunnier months, and as well as the electric grill the range includes furniture, picnic baskets, gazebos (like this one) planters, loungers and all manner of food containers. The range goes on sale in Aldi stores from 28th April 2016. Aldi were kind enough to send us one the Ambiano Electric Grills which features quite prominently in the range. This isn't our first Ambiano product from Aldi (this espresso machine was), and just like Crane, the makers of many of the clothing and sporting equipment Aldi carries, the quality is far higher than the price. The grill is a simple yet effective bit of kit, featuring an electric wall plug and a slider control on the front to increase the heat. As well as the grill unit itself, which can happily sit on any surface, outside or in, the kit also contains a stand with additional storage space. Setting it all up is as easily as screwing in the metal legs and clipping on the plastic shelves, then you plug it in, whack up the slider, and wait for it to get hot. Which it did in just a few minutes. The first time we powered it up (yes, inside Test Pit Towers) there was a bit of a strong smell, which many people might recognise as 'New Hot Metal Smell'. This soon faded, but we do recommend (and possibly Aldi recommends this in the instructions we never read) to give the removable grill plate a wash before use. But, as we said, within minutes it was sizzling hot and awaiting our raw and manly meat/Portobello mushrooms. Veganism for the win! What makes it great for indoors cooking isn't just the fact that it is so portable and smoke-free, but because there is practically zero mess generated by it. All fat and juices that run off from the food is channelled down a little hole in the grill plate and into a removable reservoir. Pull it out, pour the gunk away, and pop it back in – no worries. The grill plate is also very easy to clean, and when used with the rear metal guard and side plastic shelves, there are no errant grease splashes to wipe up afterwards. This lightweight grill makes the perfect alternative to messy, smelly, difficult to light conventional barbecues. When the rain cometh you can simply pick it up, take it indoors, and let the party continue. Right, we'll be 'round yours in twenty... okay? And look; you can even set it up at your desk at lunch time! PLEASE NOTE: This was a terrible idea and we do not recommend you do this. We melted the F6 key.